With the focus so often on Apple’s iPhone and iPad, it’s refreshing to hear some news related to the company’s humble iPod touch device instead. According to reports, the multimedia player is reportedly set to undergo a pretty major redesign, with launch rumored for September – alongside an expected refreshed iPhone and new iPad Mini. Apple fan site MacRumors has had its ear to the ground, detailing the latest report from KGI Securities analyst Ming-Chi Kuo, who the site says has been reliable in the past regarding Apple’s product plans. Kuo says the fifth-generation iPod touch will incorporate in-cell technology, enabling a thinner screen. The same technology is expected to be used with the next-generation iPhone. A thinner screen doesn’t necessarily mean the device itself will be slimmer. Instead, it could mean an overhaul of the internal components, or the introduction of a bigger, more powerful battery. MacRumors also picked up on a piece by Japanese blog Macotakara, which appears to back up Kuo’s report. Again, in line with expectations for the next-generation iPhone, the iPod touch is expected to get a 4-inch screen, replacing the current 3.5-inch display. Its current A4 chip could also be replaced by the more powerful A5 processor. 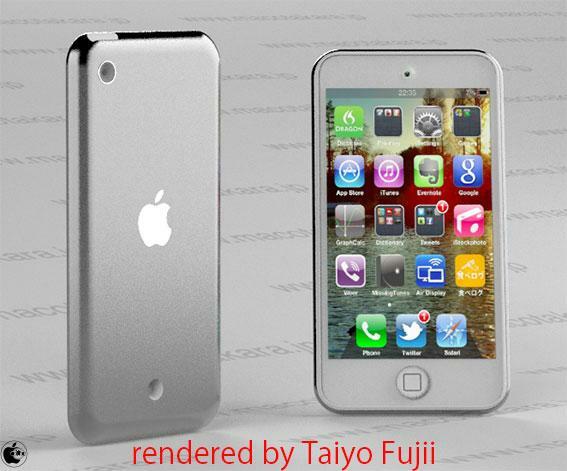 The site also claimed the back case of the next-generation touch will have a buffed aluminum finish (see rendered image at top of article), replacing the current easily-scratched mirrored steel back. Macotakara also mentions an indentation in the lower half of the touch’s back casing, although no mention is made of what it might be for. First unveiled in 2007, the iPod touch has proved popular with those who want the iPhone experience without the phone (and accompanying costs). It’s also been a hit with children, teenagers and mobile gaming fans. Its last major redesign was back in 2010 when its Retina display was introduced, along with a camera. Speaking of cameras, there’s no word on Apple improving the touch’s current one, though the tech giant would do well to bump up its resolution, which is rather poor and well below the standard of the iPhone’s current camera. If Apple has decided to spruce it up in the way that today’s report suggest, it’ll have a powerful and stylish multimedia machine on its hands which should prove popular with consumers for a few more years yet.